Just bought a 2000 buick century with 74K miles. it has a v-6 motor. service shop says oil had coolant it. they dumped the oil before I could see it. They did show me there is coolant leaking to the outside of the manifold. I assume there is coolant running through the manifold but can't imagine there is an oil path there. Does that mean coolant gets past the rings on the intake stroke?? How can I determine there is an actual problem that needs correcting. will it show up on the oil dipstick?? What will it look like?? When should I check the dipstick, running, recently turned off, or after it's been off overnight?? What will be the likely result if I continue to use the vehicle with this problem. 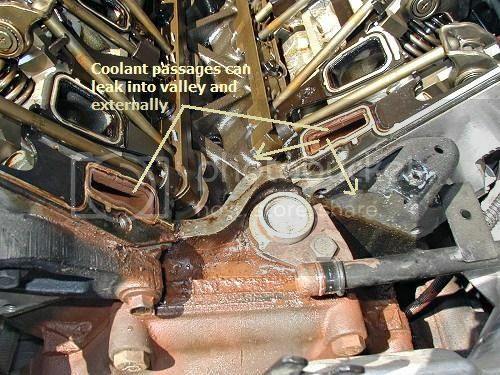 You should address that problem because when the lower intakes disintegrates on those coolant either leaks from the sides of the manifold or coolant can actually leak into the lifter valley. On the 3.1 and 3.4L if coolant is leaking into the lifter valley it can get on the cam bearings and cause camshaft failure. Coolant in the oil is a bad thing for engine bearings, so hopefully you get it fixed soon and it wasn't running like that for a long time before you bought it.